We’ve all seen or read numerous interesting and informative articles reciting the rules for a long and healthy life. How many of us follow them? It seems we all know what we should do, but many of us with good intentions are not actually following a healthy lifestyle even though we hope for good health. Your healthy lifestyle may not necessarily be a perfect one but it can be one that makes it easy for you to support your health and wellness. That doesn’t mean it won’t take some effort to choose healthy foods over convenience or choose to exercise when you would really rather binge watch a great TV show. If you have read this far, it tells me that you are attuned to how lifestyle may affect your health. As the Health and Wellness Editor for Professional Supplement Center, I’d like to share what I’ve personally learned from many hours of research. Basic healthy living comes down to 8 simple steps for maintaining good health and supporting healthy aging. As you will see, they are all interconnected. #1 – Eat nutritiously – I really can’t stress enough the importance of nutrition. It may help to remember that you have to eat well to be well. Eating well is not about dieting, counting calories or deprivation. To eat well is to eat simply, by choosing nutritious foods as close to their natural state as possible. Rather than concern yourself with limitations, think in terms of balance, freshness, color and variety. Here are some simple questions that I use to determine my own food choices: If I eat this food, will I feel good afterwards or will I feel bloated, cranky, tired or guilty? Will this food provide the nourishment my body needs or just tummy stuffing empty calories? For me, it comes down to choosing foods that feed either wellness or illness. If health is not the answer, I move on to something more nutritious. Equally important is hydration, so be sure to drink sufficient water every day to satisfy your thirst. #2- Exercise regularly – We all know we should exercise every day, yet many of us can’t or won’t find the time to give our body the activity it craves. As a former ballet dancer, I know how good it feels to move your body and how well the body responds to frequent exercise. The thing about exercise is this, the more you move, the more your desire to move increases. By making exercise a part of your daily routine, you will start to see positive changes to your body image along with your physical and mental health and may actually find yourself looking forward to physical activity. Diabetes? Heart disease? Metabolic Syndrome? Nope, not for me, not if I have a better chance of avoiding disease by adding exercise to my daily routine. And not for you either if you can find some physical activity you enjoy and do it regularly. Your body is designed to move, so move it! Besides, you can always watch that TV show later without guilt, after you’ve exercised. #3 – Get sufficient sleep – For those who want to maintain their health, scientific evidence supports sufficient sleep as an adjunct to a nutritious diet and exercise. A poor night’s sleep not only affects our ability to create and concentrate, it also affects our ability to make healthy food choices. Insufficient sleep promotes hunger and increased appetite and negatively affects appetite hormone regulation and insulin response. Making a good night’s rest a priority not only aids attentiveness, productivity and mental alertness, it can aid in your quest for optimal weight and wellness. So put down those devices, turn off the TV and get regular, restful sleep and wake refreshed, energized and ready to tackle the day. #4 – Maintain a healthy weight – Notice that I didn’t say you need to be as thin as a runway model. You can be slightly overweight and still be healthy. However, weight is more than a cosmetic concern. While at a healthy weight, our bodies can function efficiently for many years. On the other hand, obesity, largely attributed to poor lifestyle choices and other factors, is connected to many chronic diseases. If you are overweight, a reduction of 5 -10% of your body weight and long term maintenance of that weight loss can bring significant health gains and a reduced risk of developing chronic disease. #5 – Reduce stress – Repeated exposure to prolonged and continuous stressors results in the chronic over-release of stress hormones and the subsequent breakdown or deregulation of many bodily systems and degenerating health. Chronic stress can accelerate the onset of disease, especially when combined with unhealthy life style habits including poor food choices, smoking or high alcohol consumption. Physical activity helps to deplete stress hormones and releases mood enhancing endorphins. Combine that with a good night’s sleep and some stress management activities such as yoga, meditation, or taking a nature walk and you are on your way to improved mental health and physical wellbeing. #6 – Drink alcohol in moderation – This is an easy one for those of us who enjoy a daily glass of wine, a cocktail or a beer after work. It’s a hard step for those who have trouble stopping at one or two. Alcohol related liver disease is due to excessive consumption and is the most common preventable cause of liver disease. Liver health is crucial to over 500 essential functions relating to digestion, metabolism, immunity, detoxification and nutrient storage. As with any illness that comes with lifestyle choices, the best time to think about your health is before problems develop. Enjoy an occasional alcoholic beverage, just be moderate in your intake. #7 – Don’t smoke – Quitting smoking reduces the health risks caused by exposure to tobacco smoke for smokers and non-smokers alike. It is the single best thing you can do to support and improve your health. Quitting is difficult as the urge to smoke is powerful, but the addiction can be overcome. Don’t be one of those smokers who intend to quit “someday.” The right time is now and here’s why – If you can’t breathe, nothing else matters. If you’re a former smoker, bravo! There’s very good evidence that you have added quality years to your life. 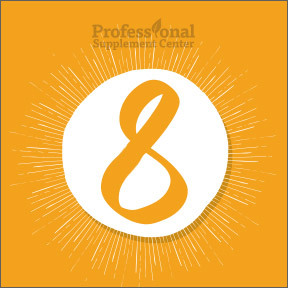 #8 – Supplement with high quality nutraceuticals – Supplementing with high quality vitamins and nutraceuticals can fill in nutritional voids, support specific health concerns and keep our systems functioning optimally. While some of us may enjoy a healthy and nutritious diet, the Centers for Disease Control and Prevention reports that only 25% of the population actually gets the recommended servings of fruits and vegetables each day and a startling 92% are deficient in one or more essential vitamins. Vitamins and minerals work synergistically, which means we need recommended amounts of all vitamins and minerals for our body to use them efficiently. My best advice, listen to your body. If your body could choose between an apple or a candy bar, it would choose the apple. A glass of water or a soda? You know the answer. To recap, eat healthy most of the time, exercise most days and get restful sleep most nights, as this lifestyle trifecta helps to form a healthy weight. Following these simple steps, along with not smoking, limiting alcohol intake, reducing stress and taking your daily essential vitamin and mineral supplements, puts you on the right track to wellness and well on your way to overall healthy aging. 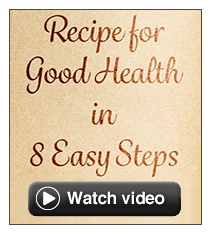 This entry was posted in Home and tagged Recipe For Good Health In 8 Easy Steps. Bookmark the permalink.